Two days ago, I asked our readers to vote on how important it is for an SEO to specialize within a specific industry. For example, you have doctors who only work with kids (pediatricians) or doctors who specialize on the brain (neurologists). You also have web developers who specialize in industries as well. I asked if SEOs should specialize and with over a hundred votes in already, I can tell you, SEOs are split on the decision. I asked "Should SEOs Specialize in Industry Sectors?" and 50% said "no," while 47% said "yes." The other responses were mostly "yes" but iffy on that response. 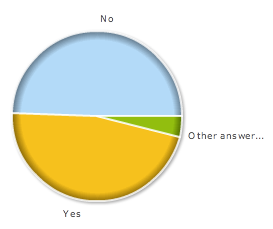 The pie chart above shows the results. Personally, I think there is a lot of knowledge to gain by focusing on an industry or two. Learning the history, the keywords, the way the industry works and how the trends impact Google's search results, can give you an edge. But yet, not SEOs can specialize nor do they want to, due to boredom. In addition, SEOs can be missing knowledge by focusing on a specific industry. Remember Yahoo's Tim Mayer's famous SEO quote? He said that when talking about a specific industry that uses very dark techniques to rank well. Tactics from industry to industry differ in some search engines and specialization does make a difference in some cases.